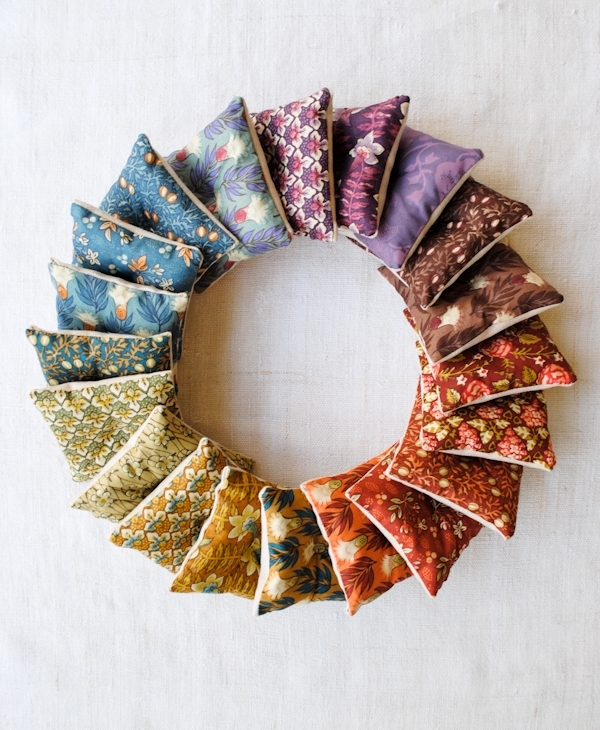 My sachet change of heart was made possible by a remarkable new product, the Dutch Chintz Garden Roll. Like sachets, chintz sometimes has a reputation for being unstylish (or “chintzy”), but these Garden Rolls quickly dispel such a notion. 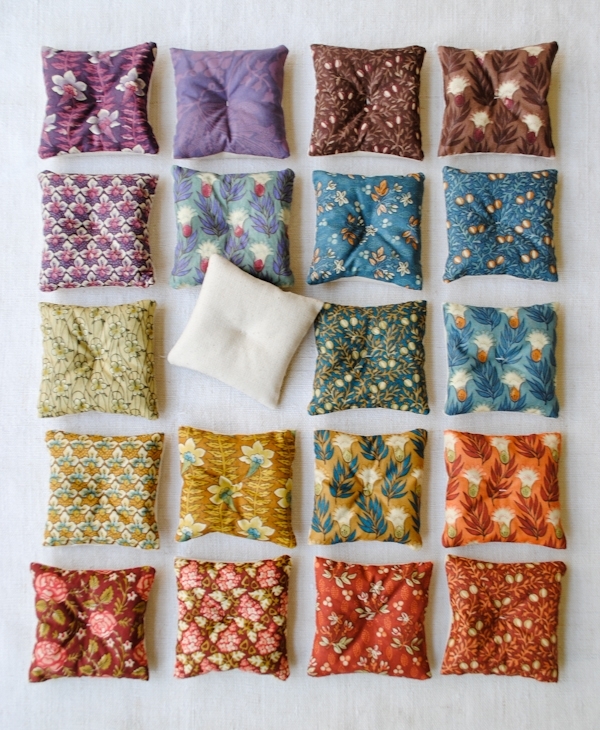 Each Roll includes a whole world of historically accurate and totally beautiful fabrics that truly spark the imagination. 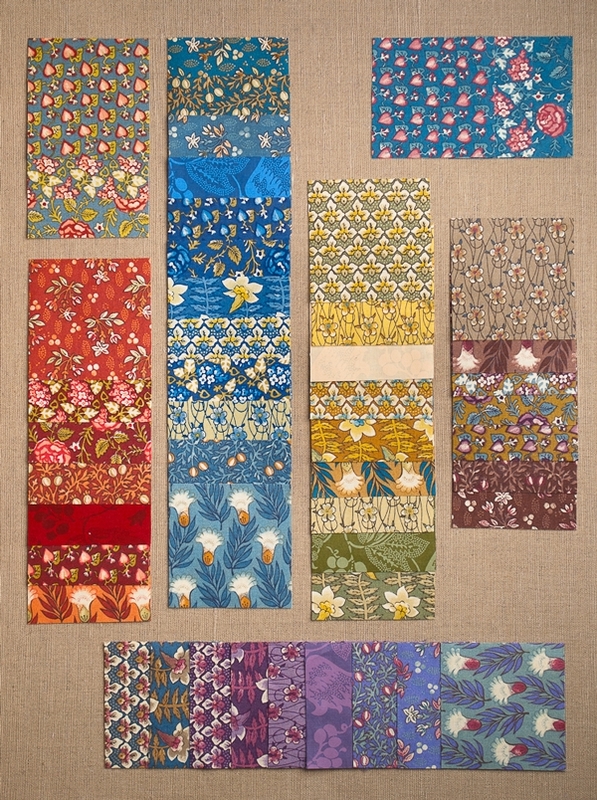 Comprised of fifteen 4-inch by 60-inch strips of fabric, each strip is divided into three different reproduction prints. Plus, there are five tone-on-tone strips. 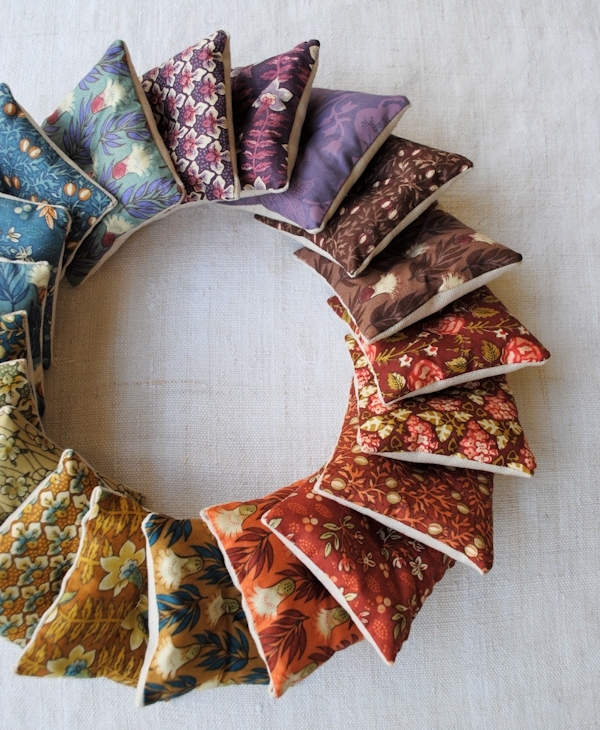 And so, swept away by this rainbow of jewel tones and extraordinary prints (whose actual dimensions are so well suited for a hand-sized project), I decided to give sachets a try, despite my original skepticism. I quickly became a sachet convert. They were so simple and fun to make, especially in an assembly line, and they made my whole house smell like lavender! 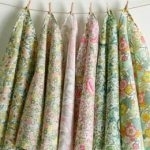 I loved picking out my favorite chintz prints and matching them with others to create fresh smelling stacks of sachets. Pick out the fabrics you’d like to use from the roll of fabrics. In the example I am making a set of 12. If you’re going to give them or use them as a set make sure you like the way they look all together. 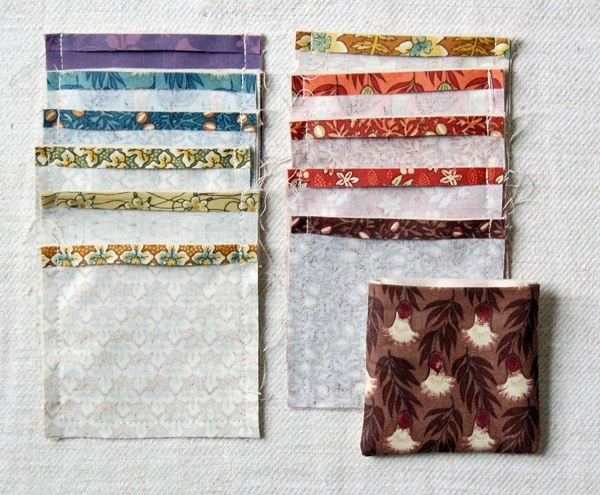 Cut each of the chintz fabrics into a 4-inch square. 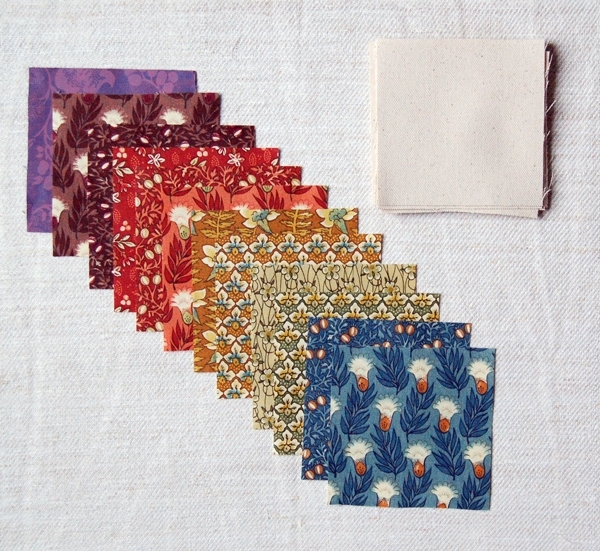 Cut 12 (or however many sachets you’re making) 4-inch squares from the canvas, one for each of the chintz squares. Press one side of each of the cut squares 1/4-inch towards the wrong side. 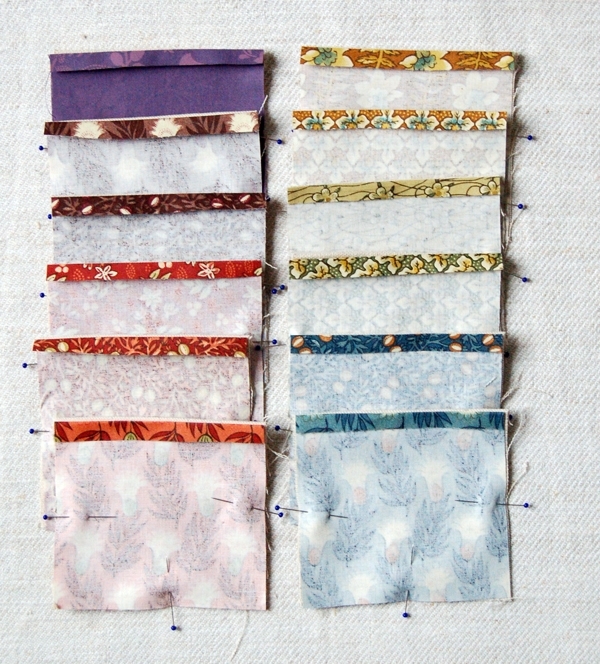 Pin each chintz square to a canvas square, right sides together, with their folded sides lined up. Do not pin the folded sides. Using the cotton sewing thread and a 1/4-inch seam allowance sew around the three pinned sides. Make sure to sew down the sides of the folds. Turn sewn piece right sides out. 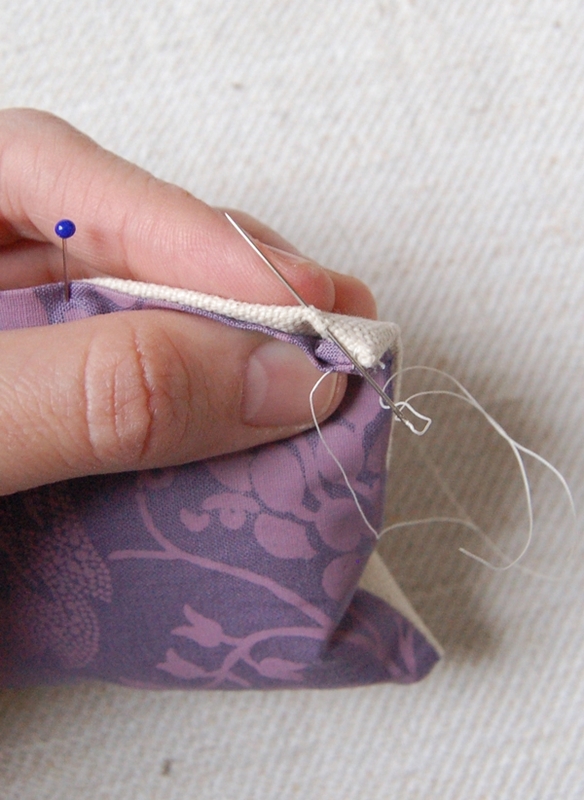 Fill each sewn pocket with 10 heaping teaspoons of lavender and pin it closed. Make sure that the folded edges are flush with one another and that no raw seams or stray threads are popping out past the pinned edge. Using the hand quilting thread sew the sachet closed with a blind stitch: Start with the knot on the inside of the fold. 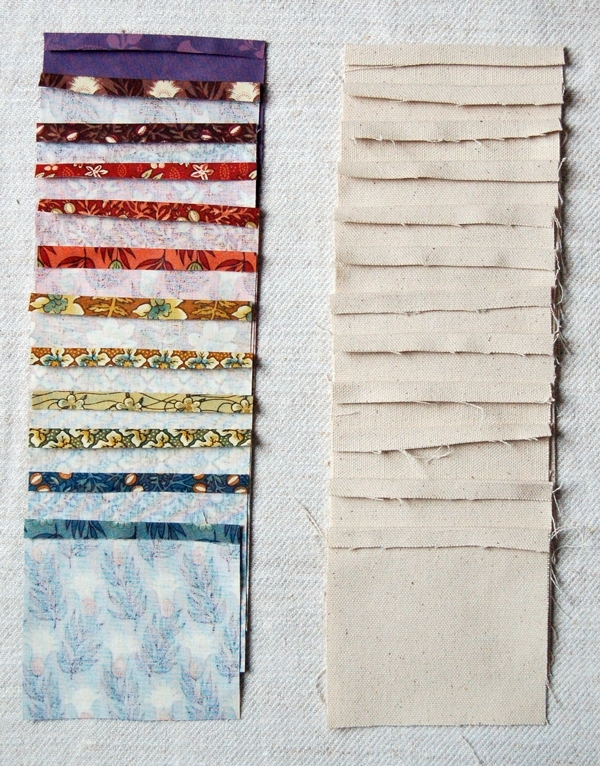 Pull the needle through along the fold of the chintz side and exit 1/4-inch from the edge. Push the needle through the opposite side’s fold (on the canvas side) directly across from the first exit point. Go back and forth like this, sewing through the folds, until you reach the end of the open side. Tie a knot at the end. 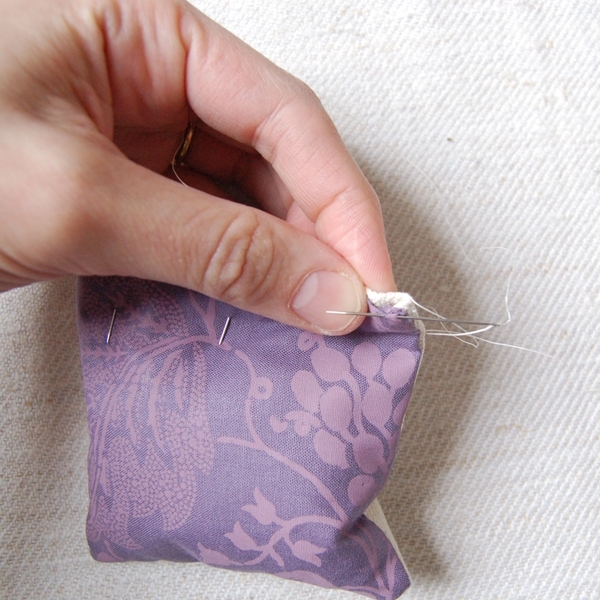 Pull the thread through to the front of the sachet and snip it at the exit point to hide the end. Thread an 18-inch length of the hand quilting thread and do not tie a knot. Starting from the canvas side of the sachet take a small horizontal tacking stitch through the sachet. Leave a 4-inch tail. Re-stitch over this stitch a few times and pull the stitch tight so that the sachet puckers towards the center, as shown above. Double knot the working end of the thread to the tail on the canvas side, making sure to pull the knot tight to secure it. Hide the ends of the thread inside of the sachet as you did in the previous step and you’re all done! Great! I thought I recognized the fabric. Is it from the Netherlands? I really love these. Thanks for the tutorial. I reblogged and linked back to you. Hope it's okay! Love this idea. Perfect in time for Mother's Day! 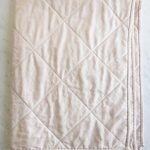 Would any quilting cotton fabric work or do you think they'd be too thick?Thanks. So simple and sweet and what a nice little gift “just because”! Can you tell me how many bags you were able to fill with 1 lb. of lavender? I want to order enough for my project. Thanks so much. You could make 30 with a 1 lb bag. Quilting cotton would work too! 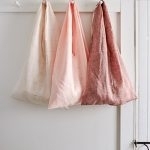 I really like these, colors are beautiful and this idea is good for mother's day! Do you know a Macaroon Pouch? This is very small pouch, shaped like a macaroon. I love for my drawers and cabinets to smell good but I don't love lavender. Does anyone have any thoughts on other herbs that might work as well? sweet woodruff works nicely. It has the scent of new mown grass or hay when dried, and lasts a long time. Eucalyptus, orange peel, peppermint, rose buds, rose hips, lemon peel, and lemon verbena. Another good option, if you want to keep moths away, is cedar chips. 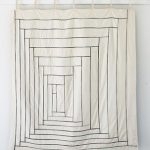 Is it OK to use quilting cotton instead of canvas? I want to get started right away! 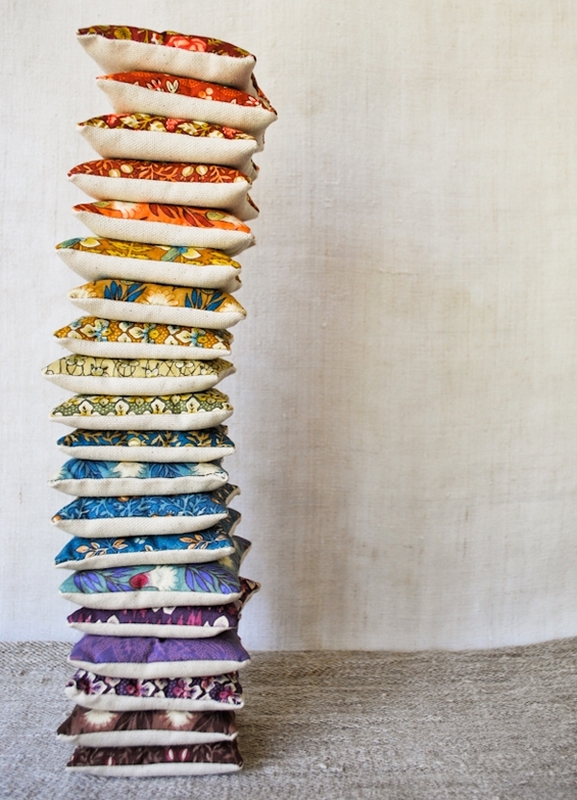 You can use any fabric you like! Good luck with the project! Thank you for this tutorial and the inspiration. I made a bunch of these up and blogged them. I thought you might like to see. Thanks so much for the fun project! Simple and beautiful, as always ! 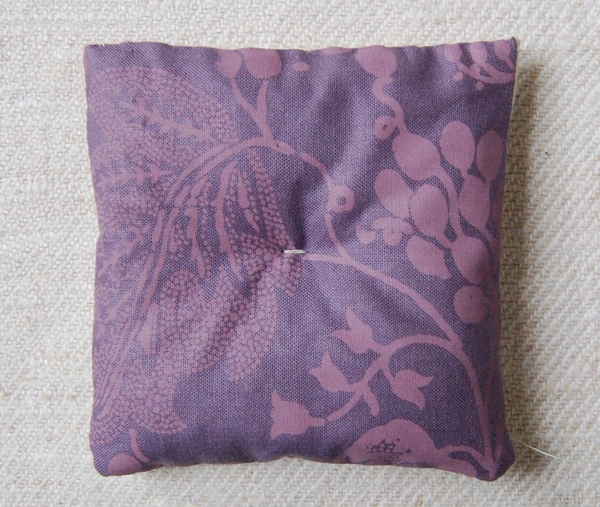 I've even turned a miniature bear's paw quilt block into a lavender sachet! Tiny 6″x6″ quilt blocks are perfect for this! I received a Coffee Basket and it included four coasters filled with cloves. Every time I use them there's a wonderful aroma. I am thinking about making another set with cinnamon and one with nutmeg. Oh, Molly, the TP covers, they are to make sure it's easily accessible to guests without an awkward moment and even more important it makes it less accessible to our four legged family and friends. Molly thank you for this simple yet elegant idea. Geri is right about the toilet tissue covers. 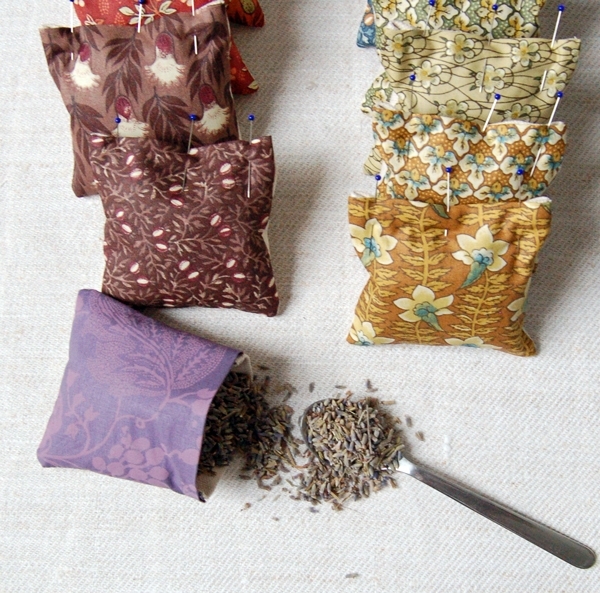 Matching the covers to a sachet and putting it into the main bath is a sweet smelling idea. Geri's idea about the coffee basket and and coaster sized sachets is one I will be making for a friend and using Coco's Easter basket for the basket…Thank you. I wanted to know how you can make the sachet smell like clean linen, what do you need to mix to have that scent? Also, another one I would like to know is maybe some Christmas scents? 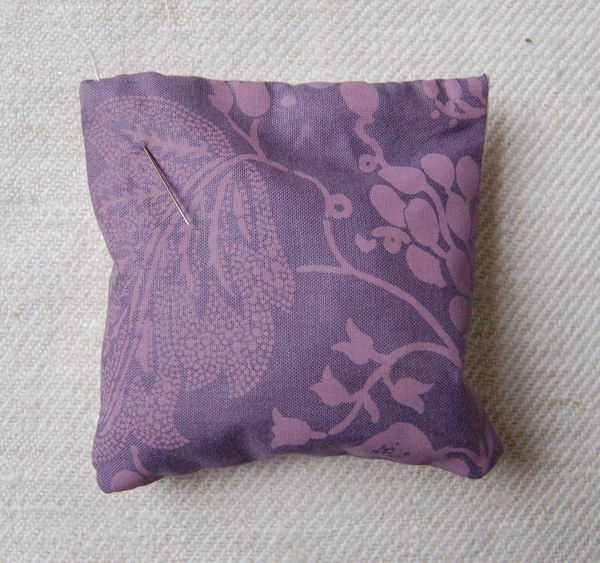 I love your lavender sachets, really clear instructions for making them, sewing is something I aim to learn, this would is a perfect starter project for me to try. PS I also love my rainbow toilet paper cover because it’s just as pretty! As a child, I always thought sachets were so silly and something only my grandma had. Now, as a woman in my 40’s using dryer sheets in my dresser and linen closet… I realize EXACTLY why they’re so useful :). 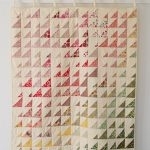 Thank you for your great tutorial; I’m going to practice my sewing skills and make some of these.